Document Relations allow grouping and easy access of documents filed in different locations throughout the Docsvault repository. 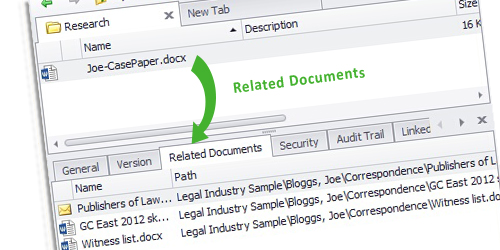 Users can set relations between documents and folders that are associated with each other and are needed for reference in future. All associated documents appear in the ‘Related Documents’ tab at the bottom panel for easy viewing. Setting relations between documents allows users to refer to associated documents instantly, so that they can,make an informed decision by getting complete details pertaining to any task at hand. Document relations feature can prove to be of great help in situations where access to relative information is of essence. This means, you can make pertinent data more available which ultimately saves time on search and retrieval if related documents are easily accessible. You can set relations between documents such as a client’s contracts, invoices, project work, reference guides, etc. to organize your documents better and ensure you have easy access to necessary information. If Auto Document Relations are enabled for an index field, files and folders that have the same values for the index field are automatically related. For example: Document relation will be set automatically between documents for the same legal case such as a witness list document and a detailed court order. Once you set relations between documents, you can see related documents in the bottom panel so that when your client calls or you need an immediate response on a project, you have all information at the tip of your fingers. Document relations can prove to be a great tool when preparing for e-Discovery as related materials are easily available. Quick access to related information means employees are better equipped and more productive.